Kristi received her Associate of Applied Science degree from Western Iowa Tech Community College in 2008. 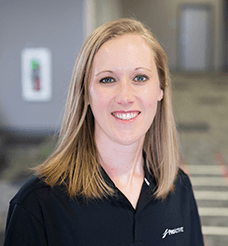 She really enjoys working with a variety of patients and injuries but especially with orthopedic injuries and the geriatric population. Kristi resides in Sioux Center with her husband Bret and four children. I get excited knowing that what we do at ProActive will help improve the lives of our patients. Q: What is one thing you’d like every patient to walk away with from their experience at ProActive Physical Therapy? I hope that every patient feels understood and respected while at ProActive and confident that they received superior care according to their needs. Q: What do you enjoy in your free time? In my free time I enjoy spending time with family and friends. I also enjoy camping and outdoor activities such as hiking and going for bike rides. I also like cooking, scrapbooking and playing games.